ESDMAN 001-8103 Work station monitor is designed to monitor the operation of two Wrist strap grounding systems and two work surfaces.This product has been designed and tested for use with dual conductor wrist straps and work surfaces grounding systems.For China this unit is designed for use with an AC Adpter included.Use of other components may cause improper performances and /or unsafe conditions. Incorrect grounding of an operator may cause electrostatic discharge damage to components or assemlies being handled.For proper grounding of the operator when using the work station monitor,use of the 2 pin AC adapter specified in the user instruction manual or supplied ground wire with ring terminal is required. Verify that the electrical ground point is suitable.If you are not sure what a suitable ground is ,contact a licensed electrician before installation. The ESDMAN 001-8103 work station monitor is designed to monitor the operation of the wrist strap grounding systems of two operators.To accomplish this,it uses a DC current source to measure a loop electrical resistance.The system uses a special wrist band and ground cord that contain two independent elements.The001-8103 monitor employs two selectable test voltages(9 and 16 volts)and resistance limits(10 Megohms and 35 Megohms)It also monitors the grounding of up to two work surfaces. The model 001-8103 monitor performs a resistance measurement by applying an electrical current of less than 3 uA approximately every 2.0 seconds for 0.2 of a second in duration.The path for the current is through one conductor of the ground cord that contains a current-limiting resistor,through one side of the wrist band,through the skin of the wearer under the band,through the second side of the wrist band,through the second conductor of the ground cord that contains a current-limiting resistor,and finally back to the monitor. Resistance/Voltage switch selection ,The model 001-8103 monitor allows for the selection of test voltages(9v or 16v) and resistance limits(10 Megohms or 35 Megohms).The additional ranges have been added to accommodate global Electrical Static Discharge requirements.Selection of the operating parameters are left up to the user’s discretion. 1. The wrist strap monitoring function is activated by plugging a wrist strap dual conductor ground cord into either one of the jacks on the ESDMAN models Dual conductor remote input jack. 2. If the resistance of the wrist strap loop is within the limits of the selected range(1.5 ohms to 10 ohms or 1.5 ohms to 35 ohms) on the Model 001-8103 monitor,the cord,the wrist band,and the contact to the arm of the wearer,it is considered to be functioning correctly. 3. At this time,one of the (OK) green lamps(1 or 2) will be illuminated on the front of the monitor.If the resistance of the wrist strap loop is higher than the selected range(10 ohms or 35 ohms)on the 001-8103 monitor,an(OK) wrist strap green lamp(1 or 2)extinguishes, and a high wrist strap red lamp(H) illuminates with an audible alarm. 4. This is an indication of a high resistance in the cord band,or poor contact between arm and band.If the resistance in the loop is under 1.5 ohms,it is an indication of a low resistance meaning one or both current-limiting resistors are bypassed.The low yellow lamp(L) will flash and an (OK) green lamp(1 or 2) will remain illuminated. A low resistance condition can also be caused by touching a grounded object or by standing on a conductive surface. The wrist strap of a second operator is measured in the same way.Operators are identified by the two(OK)green lamps(1&2).However,the same high wrist strap red lamp(H)and low yellow(L) lamps illuminate when a fault is detected. The green lamp that extinguishes identifies the operator that is experiencing the fault condition. There is a concern about the voltage that is applied to an operator while they are connected to a monitor.Some of today's electronic components are extremely sensitive to electrostatic discharge from a person(less than 10 volts).The following chart for the Model 001-8103 monitor illustrates the level of voltage that will appear on the operator under various resistance conditions. For wrist strap malfunctions the model 001-8103 monitor indicates a different tone for each operator-a continuous tone for #1 operator and a fast chirping beep for # 2 operator.The volume of the wrist strap alarm is adjusted by selection of the internal DIP switch #1. The Model 001-8103 monitors its connection to ground and the grounding of a ESD work surface.A loop resistance is measured from the monitor,through a Monitor/Table mat cord to the work surface,across the conductive layer of the work surface,through the grounding wire of the work surface to an electrical ground and finally back to the monitor through the grounding wire. 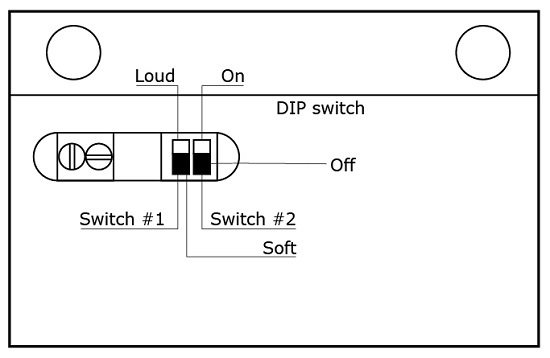 If the resistance of the loop exceeds 3.7 ohms,the work surface high red lamp(M) will illuminate and all green lamps will be extinguished.If DIP switch #2 is in the ON position,the audible alarm will activate.If no ESD work surface is to be monitored,the Monitor/Table Mat Cord and the ground wire of the 8103 must be connected to an electrical ground.This is done to ensure that the 001-8103 is providing a ground connection for the operators.Again,if the loop resistance exceeds 3.7 Megohms the work surface high red lamp(M) will illuminate and the alarm will activate if selected. The grounding wire from the work surface and the ground wire from the model 001-8103 monitor must be attached to separate electrical grounds.The work surface monitoring function is active any time that the power supply for the monitor is plugged in. 1. Mount or position the Model 001-8103 monitor so that the lamps are easily viewed by the operator.Mount the Model 001-8103 monitor to the underside of a work bench top or shelf through the two holes located at the top rear of the case using the two screws supplied.If using the screws is not possible,apply an appropriate amount of durable,double-sided adhesive foam tape to the case. 2. Locate the Model 001-8103 Dual Conductor Remote Input Jack so that it is convenient for the operators to attach their wrist strap ground cord.Mount the remote with the screws provided. 3. Plug the AC adapter into the grounded outlet(Outside China use appropriate AC adapter).The 001-8103 is ready for use.